This ingenious design by Rainer Wenning and knifemaker Thomas Braunagel will be a must for those wanting a tactical pen with a twist. The "bolt action" mechanism and "click" open and close will make it difficult to put this piece down. 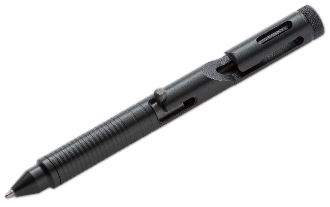 The flat pen head provides a secure thumb rest, making it an effective self defense tool as well. The Clip Integrated Design (CID) offers the advantage of easy placement in the pocket. The sturdy clip has minimal give to provide a comfortable draw resistance in normal tactical or denim pants pockets. The body of this new tactical pen, CID .45 CAL is hardcoat anodized CNC milled aluminum, providing style and optimum ergonomics. Black finish. Not a firearm. Compatible with LAMY #M22 ink refills, which can be purchased at www.lamyusa.com.